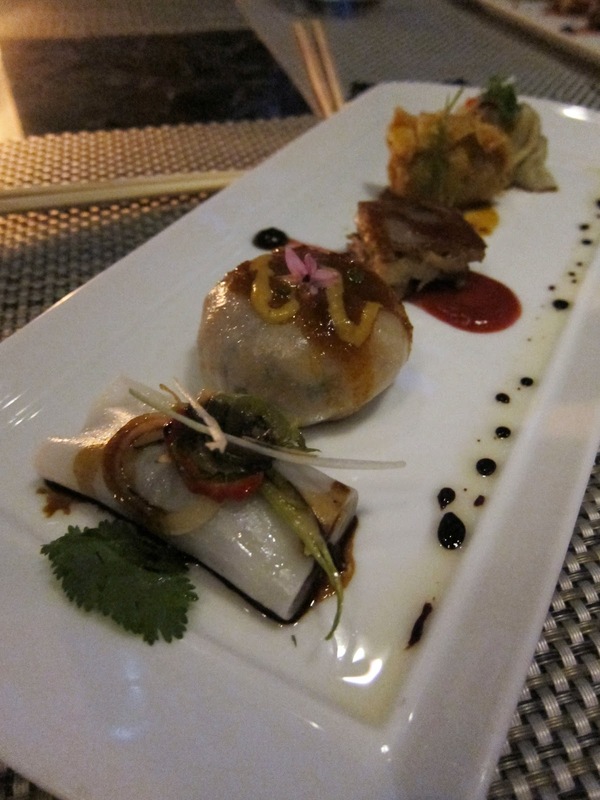 With the abundance of authentic, affordable Chinese cuisine within 30 minutes' drive in the San Gabriel Valley, what, you ask, would possess someone actually from Hong Kong to visit Wolfgang Puck's 'modern Chinese' spot, WP24 in DTLA? I had been craving fine dining Chinese, had heard great things about the place from trusted sources, and when an acquaintance invited me to dinner there - I decided to give it a shot, cautiously optimistic for potentially inspiring takes on Chinese cuisine. Towering above the steadily gentrifying hub downtown around the L.A. Live / Staples Center area - WP24 sits on the 24th floor of the Ritz Carlton hotel. 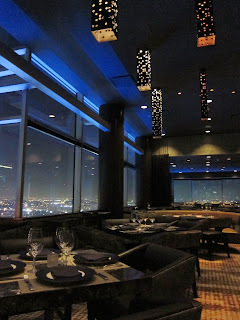 The view at night is certainly spectacular - from either the lounge or the more formal dining room. The setting almost does remind me of high-rise fine dining in Hong Kong. The patrons in the lounge and dining room are distinctly different - reflective of the decor of each. Whereas the lounge is chic but casual, the dining room is formal and caters to a more upscale, older crowd (mid-late 30s and up). As everyone else in our party wanted to try the tasting menu, we were seated in the dining room. When ordering from tasting menus, WP24 requires that they be ordered by everyone at the table, which makes sense for the flow of the meal at the table - so we finally settled on the 6-course one. At $140 per person this menu pained me physically - but I went with it since everyone else wanted to go 6 (2 wanted to go 10-courses, but there was no way I was going to pay $170 for Chinese food that I can get at Michelin star quality in Hong Kong). So first tip of the day if you're going to eat in the dining room is, make sure there is consensus among those at your table before going in - otherwise you might end up with a much larger bill than you anticipated. But I kept an open and optimistic mind, and we seemed off to a good start when a series of four amuse bouche arrived (these actually initially confused us because they were so generously portioned that we had to ask our server whether these were other people's starters delivered to us by mistake). 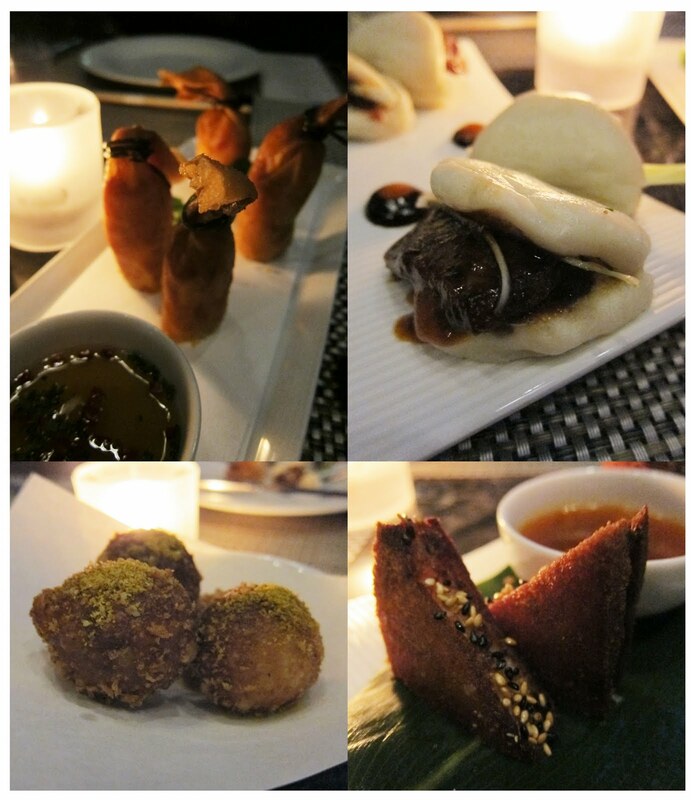 The “Several Tastes of Good Fortune” consisted of lobster/crab spring rolls wrapped like wine bags for a nice presentation, foie gras bao, spiced lamb fried balls and prawn toast. All were tasty, but the foie gras bao (bread bun) of course stood out the most to me, as an interesting small but significant twist on the dish that is usually served with peking duck (and indeed it came witih all the garnishes you would normally see with peking duck). 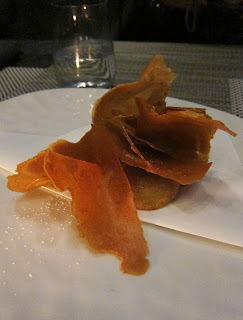 The rich, buttery lobe of foie went surprisingly well with the fluffy steamed buns. First up after the amuse was “Hot & Sour” Soup with Sweet Prawn Wontons, Fresh Peas, Micro Basil, Fried Ginger and topped with garlic flowers. 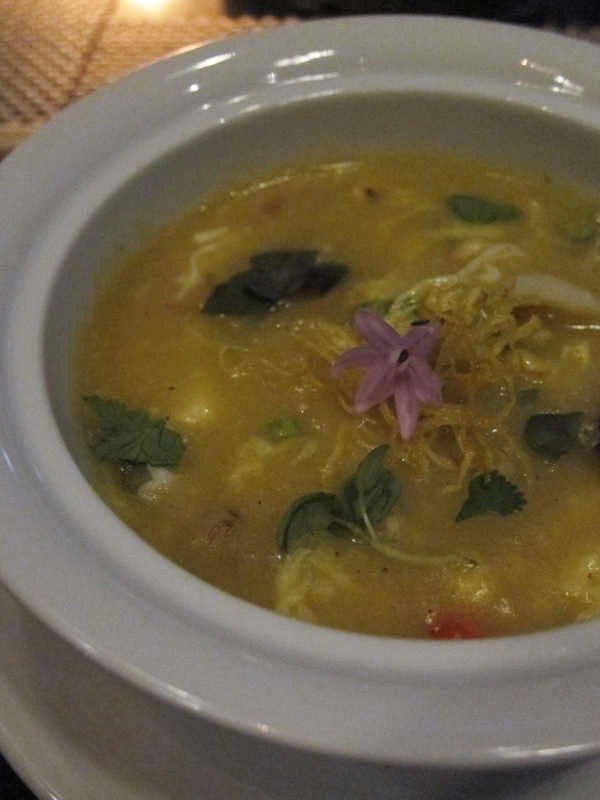 This was WP24's interpretation of hot & sour soup, which semed more like a 'mash-up' of all the traditional Chinese soups together: starchy hot & sour + seafood soup + wonton soup + egg drop soup with corn. It was an interesting and tasty mix, but not mind-blowingly innovative in concept or flavor. Next was Today’s Dim Sum Plate - featuring Chive Crystal Dumpling, Dan Dan Dumpling, Tiny Dumpling, Scallop Sui Mai, and Suckling Pig with Quince-Apple Puree. If this was the first time in my life I'd ever tried dim sum - I might have enjoyed the novelty of this plate and the bite-sized little dumplings and cheong fun (rice noodle roll). But because I've had 'real' and really mind-blowing, exquisite dim sum in Hong Kong (and at Yank Sing in San Francisco) - this plate was a complete disappointment. Creativity and technique were both absent from this plate. Almost all of the dumplings were standard fare, and overcooked - inside and out - with the seafood much too firm, and the wrappers not much better in texture. At this level and price, the scallop/crab etc. should taste incredibly fresh, with its natural sweetness and ocean flavors coming through with each bite. Instead, the dumplings were overall too firm and bland, with the exception of the cheong fun (rice noodle roll) that had a pepper slaw on top which added some single-note heat. The suckling pig was also on the dry side and did not have the signature crispy skin. The first entree sized dish was Live Maine “Angry Lobster” with Spicy Szechuan Chilies, Fried Garlic, and Black Bean Dust. This was served with a bowl of Lop Cheung Sausage Fried Rice for the table. This too, failed to impress as it did not bring anything new to the table - just another traditional Chinese preparation, poorly executed. The lobster was plated table-side, as Chinese restaurants would typically do, and two of us furthest away from the server could tell even from a distance that the lobster was overcooked - the meat had a turgid quality that we could see from 10 feet away. We wanted the sauce to be a bit more clean and sophisticated - but it tasted slapped together, and was slathered thickly onto the lobster - completely smothering any hope of us tasting its presumed freshness and natural flavor. The fried rice lacked 'wok air' - the fragrant 'heat' that comes from cooking on a nice hot wok which releases the flavors of the food. It was more...just overwhelmingly sweet without the distinct 'perkiness' of well cooked rice. Just from reading the menu, the course I most looked forward to was the Whole Roasted Duckling “Peking Style” with Stir-Fried Fall Mushrooms, Snap Peas, Scallion. Peking duck is one of my favorite dishes - even as a kid I appreciated the balance of yieldy meat/juicy fat/crunchy scallions and those savory flavors interlacing with the sweetness of hoisin sauce - and all the goodness of that combo soaked up in a warm, pillowy bao (bread bun). WP24 sticks with tradition in this dish as well, bringing out the whole roasted duck for viewing before serving carved pieces on plates with steamers of bao and a plate of garnishes including Stir Fried Fall Mushrooms, Snap Peas, and Scallion. 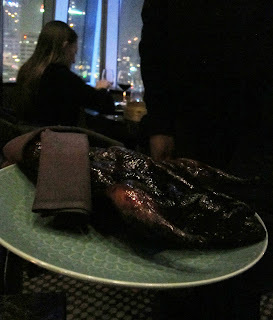 This dish made up a bit for the faltering of the preceding ones - it was an admirable effort, not the best Peking Duck I've ever had, but a decent and fairly delicious attempt. 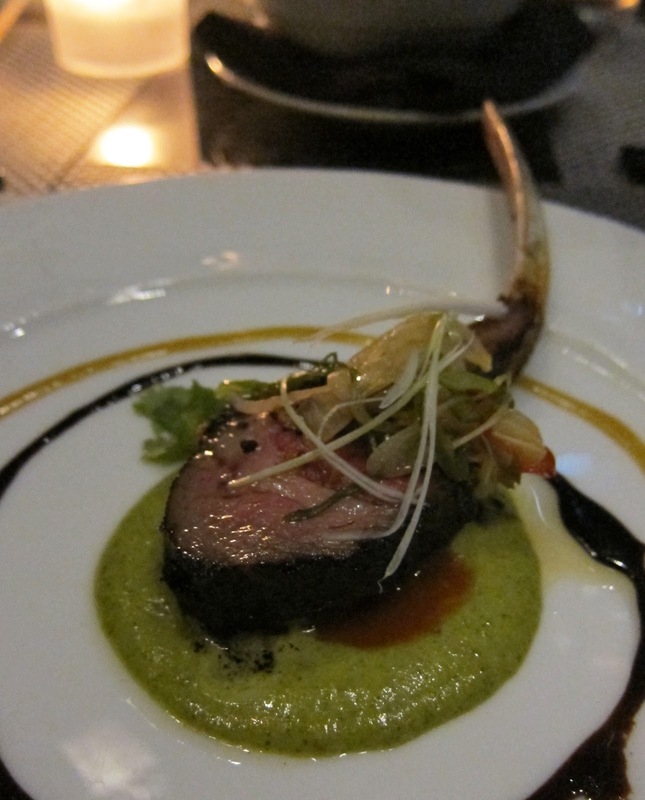 There was one dish that night that our table unanimously voted as a favorite, and it wasn't really Chinese: Grilled Lamb Chop Lacquered with Coriander-Pickled Ginger Sauce, Fresh Chilies & Aromatics. This was served with Spicy Chow Fun, Fragrant Thai Basil. We liked everything about the dish, from the enticing presentation, which seemed more artful than the others, to the incredibly juicy, tender texture and finally great interplay of flavors coming from the rings of different sauces around the meat. The chow fun (thick, flat noodles that are stir-fried with minimal sauce) was forgettable and didn't really go with the lamb dish, which seemed more of a western preparation with sauces using eastern ingredients. As a pre-dessert/ palate cleanser our next course was Lychee Yuzu Sorbet with Coconut “Explosion”. This basically consisted of a scoop of lychee yuzu sorbet, and a coconut spherification served on a spoon. 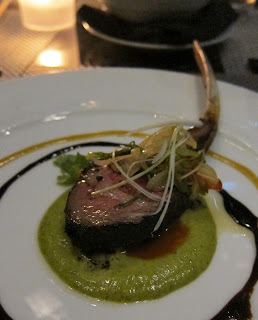 Both were refreshing after the intense flavor of the lamb course and served as a good transition to dessert. Our dessert course was Sweet White Corn Fritters served with Pandan Ice Cream, White Chocolate Corn Pudding, and berries. I actually really enjoyed parts of this dish - especially the corn fritters, which were lovely, fresh sweet corn in fresh fried dough - and something I've never really had before. All at the table agreed that the other elements of the dish did not come together in a coherent way, but seemed like 'dessert chop suey' - a mish-mosh of disparate ingredients thrown together with no apparent point of view. 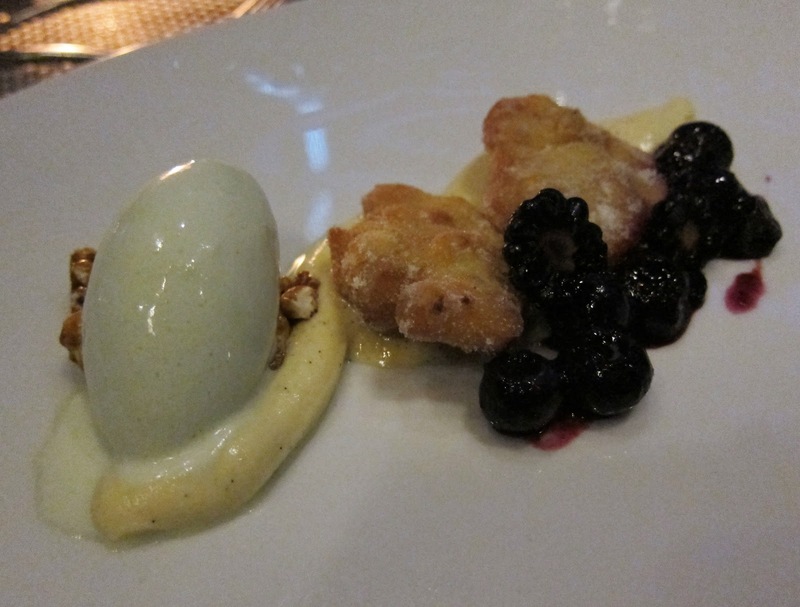 For example, in theory, we get the sort of play with corn - having it in the fritter, then putting it also in popcorn form with the caramel popcorn kernels piled beneath the ice cream. But on the plate, they just didn't go together and the popcorn was stiff and awkward to eat along with the ice cream and fritters and berries and pudding. We finished out the meal with a complimentary Cookie Plate - deconstructed fortune cookie, and other traditional cookies (I think they were almond?). 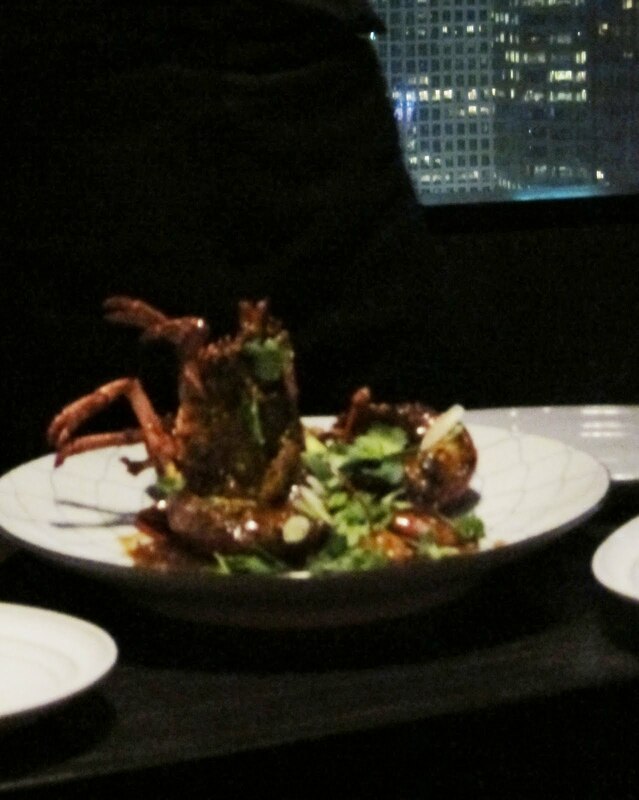 All in all, I was not happy to have paid Michelin-star prices for a meal that didn't in my view aspire in general to deliver anything more than traditional Chinese fare, and did not even execute those dishes at fine-dining level. Is it unfair to compare this outpost of LA Chinese fine dining to masters in their country of origin? Yes, probably. But even without that measuring stick, the quality of our meal in my view did not justify the $140 - I would have much rather spent it on 5 satisfying meals in the SGV (albeit without the view and ambiance), or a really mind-blowing one from Providence. And, unlike other restaurants that have chefs of a culture not reflective of the featured cuisine, where they are using the cuisine's flavors and ingredients and being inventive and interpretive with it - so that at least you get to experience something new via their perspective - WP24 seems to for the most part just take the traditional preparations and 'introduce' them to guests at inflated prices. I do wish for more fine dining Chinese food in LA to shift the view of Chinese only as greasy food served in chaotic, loud, hole-in-the-wall spots or staid parlors - to show that it can take a seat at the table of esteemed culinary artistry as well, as it does in Hong Kong. WP24 gets it right in terms of venue - but unfortunately the food that night left me wanting. Food aside, the true draw of WP24 is the venue - the view is truly incredible at night - and they do offer a daily Happy Hour 5-7pm with a 3-course prix fixe menu for $24, served in the lounge only. For that deal, I would return - to the lounge. Otherwise, for my money, next time I want Chinese I'm going to forgo the curiousity with western interpretations, and sticking with the SGV.